This project envisions 270 modular single-family homes built over four years. With input from the community and the City, Bauer Latoza Studio is designing the units with detail and floor plan variances to accommodate specific needs. In pursuance of LEED for Homes certification, sustainable design components will include select finishes, rain gardens, plant selection and other systems that curb energy consumption. This new charter school is located in a former industrial warehouse building that was rehabilitated to meet the needs of elementary and high school students. 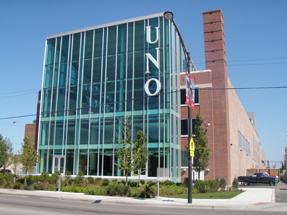 The project was awarded LEED Gold. 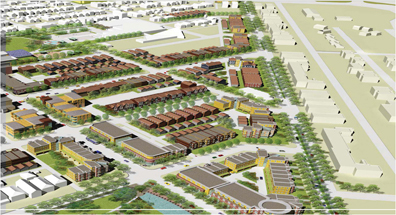 Bauer Latoza developed the planting and site design to promote sustainability, provide alternative stormwater management, and offer educational opportunities. In an effort to promote a healthier community, the Puerto Rican Cultural Center led efforts for the installation of a new greenhouse atop their award-winning alternative high school. The greenhouse will enable the school’s math and science program to expand to planting and producing fresh fruits and vegetables for healthy living. 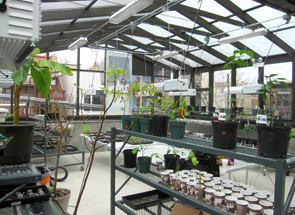 Bauer Latoza Studio was retained as architect to provide design services for an assessment and feasibility report, construction/permit documents and construction observation for the new greenhouse addition. 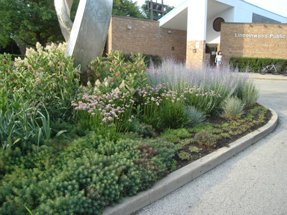 Bauer Latoza Studio expanded Lincolnwood Public Library’s parking lot by upgrading the landscape design, and providing better on-site circulation for pedestrians and vehicles. The expansion provided an alternative approach to stormwater management incorporating permeable pavers, rain gardens and native plantings, contributing to more sustainable surrounding.